Have you ever felt instantly happy walking into a room? Chances are it’s down to the lighting. The importance of good lighting has been known for centuries. But the big trend right now is ‘smart lighting’. What are we on about? Smart lighting can encompass a lot of things. Think clapping your hands to switch off the lights or asking Alexa or Echo to dim the room for a romantic date night. It’s made possible by the collaboration between Amazon or Google’s virtual assistants and your special smart lamps. All you need to do is hook up your lights to a smart device like your phone or tablet. 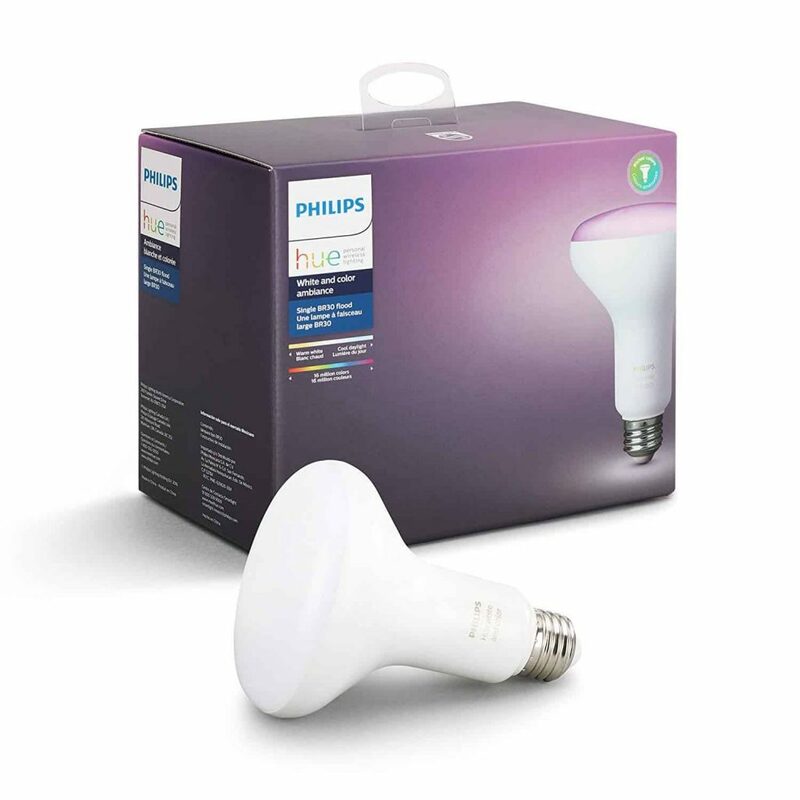 Our go-to brand for smart lighting is Phillips. The reason? Their traditional lights are second to none and they’ve nailed the new technology. First up is the Hue dimmable bulb. This light specializes in creating millions of color combinations to achieve the perfect ambience, every time. The colors are rich and will instantly transform your mood. You can control all your Hue lights from the comfort of your bedroom or even outside the house. All you need is a good wireless connection. Here’s the fun part! If you love listening to music, watching movies or gaming, you can actually sync your lights with your activity. Awesome, right? Installation is a breeze. Just insert the light as you would a traditional bulb. To make the most of the new features, you’ll need to download the Phillips Hue App. Also ensure that all your devices are paired correctly. Don’t worry, it’s all made easy and instructions are included. These bulbs are on the pricier side, especially if you’re looking to replace all your lights. Our tip is start with a few. See how they are in different rooms and gradually switch up all your lights. Love vibrant colors? The Hue is for You. Use soft lighting for a relaxing ambience or turn your home into a full on disco. Be ready to encounter minor hiccups, especially if your light switches are very old. Philips provide outstanding support and don’t forget: All items are returnable. Hue bulbs are energy star certified, so you’ll be saving on your bills. This is the humble table lamp re-invented for 2018. Wonderfully lightweight, the Hue Bloom dimmable smart lamp can be plugged in anywhere in your home. We love that the cover feels like beautiful, smooth porcelain. As with its brothers and sisters in the Hue range, it’s capable of producing millions of color variations. Use it to highlight the best features in your home. If you’re a movie buff or a gamer, you can sync your light with the rhythm of your entertainment. We were watching the game the other day and the light flared up every time my team scored. Result! The Hue Bloom can be controlled by voice through Alexa or through an app on your smartphone. Something you should know: You really should get the Hue Bridge to make the most of this light. It’s sold separately, but worth it. Other brilliant accessories include the dimmer switch, Hue tap and the Hue Motion Sensor. But if you’re worried about splashing the cash, start with the Bridge. This light is pure fun. It can bring your surroundings to life with the most spectacular colors. However it’s not designed to be a very bright light. For example, it’s not the best for late night reading. Also you should prepare to spend extra money on the accessories. They really make it. The Lumenty smart lights are among the most revolutionary smart bulbs on the market. They are bright, color changing bulbs controlled directly from your smartphone or by voice activation. No separate hub needed! In addition to Alexa, these smart bulbs are compatible with Google Home. If you’re an Amazon user, you can pair it with your Echo. 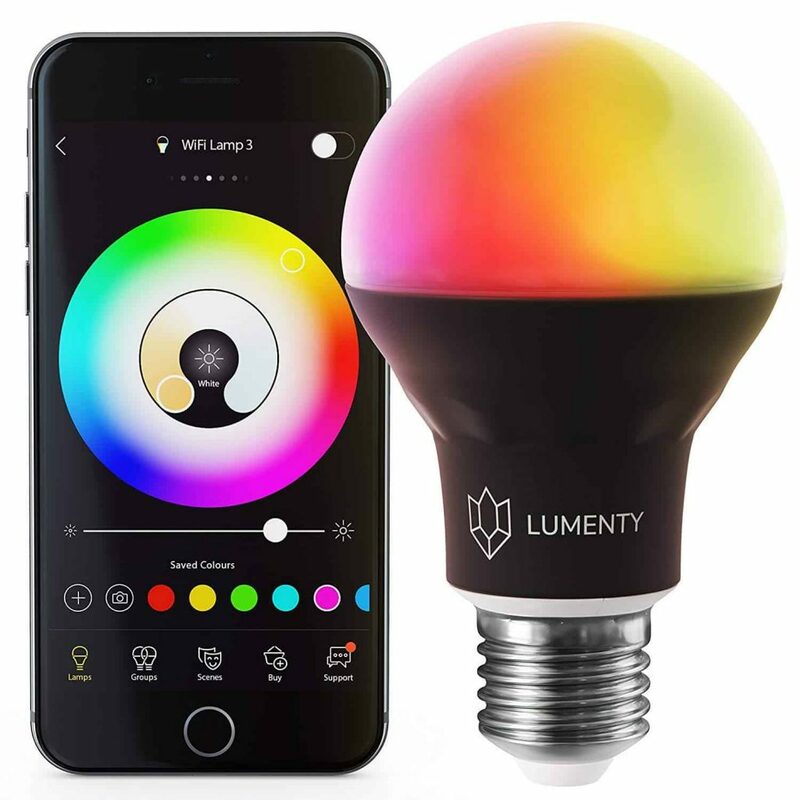 The initial set up takes less than 5-minutes, all you need to do is screw in your bulb and download the Lumenty app. The app is straightforward, designed for all abilities. These are dimmable bulbs, which allow you to control the ambience of your room. You can have tons of fun with the features. To give you an example, you can create a sunrise hue for when you get up and sync the lights with your favorite music when you’re having a party. There’s not much to fault with the Lumenty! Other than we loved them so much that we wish we’d ordered a crate of them. One bulb isn’t enough to light up your whole space, so think about putting a few in your cart. Out of all of the smart lights we tested, this is probably our favorite. We mainly use the automatic light effects to fit our moods throughout the day. Moreover, it's already paying itself back through plummeting electricity bills. LED LIGHT BULBS THAT YOU'VE BEEN WAITING FOR: Bright, easy to set up, color smart bulbs no hub required. Over 16 Million colors and lighting effects in a single bulb. Control your home lighting with our user-friendly app. With intuitive design, creative features, 24/7 in-app friendly and responsive support, and regular software updates, the Lumenty app is designed to make lighting more fun and unique. No hassle. No weird setups It's easy and frustration free. 1. How does Alexa work? This voice recognition technology is quite mind-blowing, but not all of us know how it actually works. First it recognises and records the words that you speak. This is then trasmitted via the internet to the Alexa Voice Services (AVS), which interpret commands from the voice recording. The AVS will then act on your request. For example, if you’ve asked Alexa to play your favorite music, it will search for it. Or if you asked Alexa to switch on the lights, it will program Alexa to do this. 2. How to set up Alexa? Good news: The Alexa setup is easy! You will receive step by step instructions that are simple and fast to implement. First you will need to connect your Alexa to a power supply. Then download the Alexa app on your smartphone. You will then be prompted to set up a new device. Follow the instructions and you’ll be ready in now time. 3. What is the difference between Amazon Alexa and Amazon Echo? The main difference between the Alexa and the Echo (or Dot) is looks, size and portability. Otherwise you will be getting broadly the same voice activation and smart features. For our favorites, read our review of the best Alexa Products. 4. How does the Alexa app work? The Alexa app is integral to connecting your Alexa with your smartphone and your lights/household appliances. It’s quick to download and easy to use! This app will allow you to instruct Alexa to control your lights whether your at home or away. It’s convenience at its best. 5. 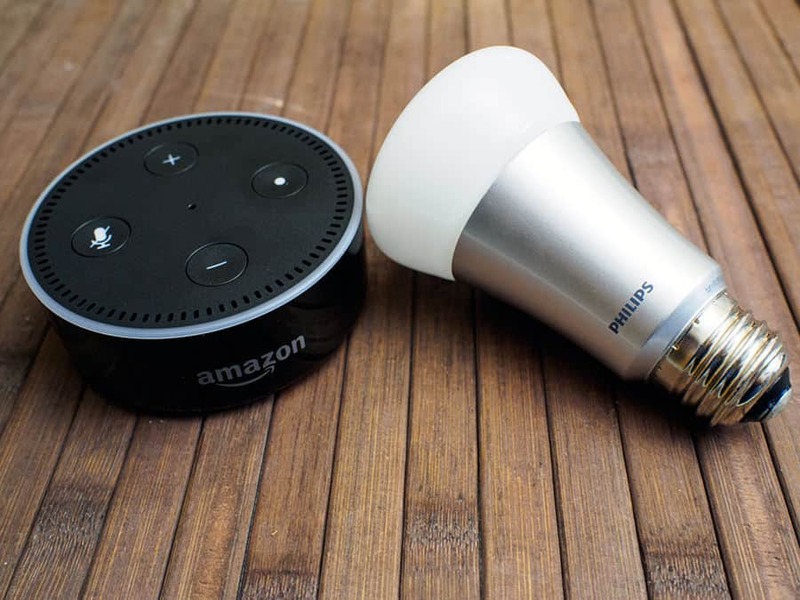 Which Alexa light bulbs are the best? There are lots of Alexa lights that you can buy. They all offer different effects for example lightbulbs that change color, sync to music or provide a unique ambience. 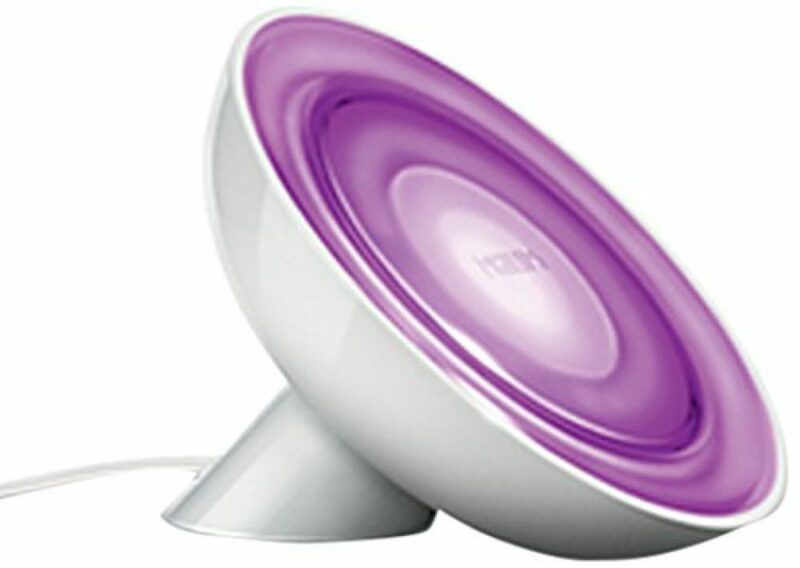 Scroll up for our favorites including the Hue Bloom Dimmable Smart Lamp. What else is trending now?